The Thyroid Cancer Care Collaborative (TCCC) is excited to share the new and improved interface and additional features for all patients. We provide clinicians with more timely access to comprehensive patient data via the other members of the patient’s care team, supply point of care integration of care guidelines and standardize the reporting of thyroid related information. The unification of thyroid patients, clinicians, education and research initiatives electronically. The Thyroid Cancer Care Collaborative (TCCC) is a HIPAA compliant, cloud-based portal and registry that enhances the quality of care for patients with thyroid disease and improves the communication between physicians. 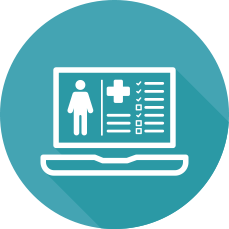 The TCCC provides portability of information for patients and centralizes all of their relevant clinical records, allowing the involved clinicians immediate access to critical information for decision making. Data entry modules incorporate time-saving features and focus on specific aspects of thyroid cancer management. The application is also an educational tool for both patients and physicians, delivering informative videos and clinical decision making modules. Whether you are a thyroid cancer patient or a doctor who cares for thyroid cancer patients, you can get started right away.